Avatars: Hindu Myths of Vishnu & Hollywood movies | QuantumPhoenix.net – Esoterica, Paganism & Ritual Magic. Avatar is a name that is very familiar to anyone who uses internet forums, chat rooms or plays online games. In these realms, ordinary people like you and I `assume’ an imaginary visual character , version or representation of ourselves, and call it `our avatar’. The ideas of usernames are linked to this concept too. In many cases, it helps people to `live out’ another version or an alternative form of themselves – but only in internet forums, where we can not often see the person behind the written words or graphics. Few years ago, a blockbuster Hollywood movie called `Avatar’ came out in all the cinemas across the world. It combined state of the art graphics, animation and special effects with live actors. In fact the lead characters in that movie were actually `people’ who were created by graphics! What’s more, the double-whammy is that, in that film Avatar, the hero Jake is a wounded and disabled ex-soldier who is – by technical methods – able to project himself into an artificially grown alien body (a tall blue race of humanoid looking person). While Jake is projected into the artificial body, Jake’s real body `sits’ inside a machine, all wired up. It’s almost the equivalent of driving another body by remote-control. These are all modern expositions and explorations of the concept of an Avatar, and in some cases, concepts `lifted’ from other realms by film-makers and Game-creators. These seem to allow the spectator or the user to have a fantasy few hours, as `someone else’. It must be noted, that in some games, the actual `avatar’ can even be a vegetable, an animal, a flame etc. Those who are familiar with the British TV character `Doctor Who’ – a wandering Time Lord, will know that the `Doctor’ has the ability to regenerate his body when mortally wounded. In fact during the life-time of the show (so far), the Doctor has regenerated 10 times, and thus in on his 11th body (incarnation). This is not quite an Avatar, but can be considered as a parallel in this matter. So where does the concept of an Avatar come from? Hinduism is a collection of ancient pagan religions, where each strand focuses on a different deity. Hinduism has 3 major gods – Shiva, Vishnu and Brahma. Shiva is said to be the great destroyer, Brahma the Creator, and Vishnu the Protector. It is here that the concepts of Avatar originally surface. An avatar is a reincarnation (rebirth) of a Hindu God in an earthly body. A Hindu God undergoes this rebirth for the love of humanity and to help one or more people with a particular crisis. The God Shiva is known to have `appeared’ on earth in various forms to help various devotees (64 of them). But these are not considered Avatars, as they were temporary forms, at the end of which, Shiva reverted to his divine form. The Most popular set of Avatars (pronounced in Tamil properly as `Avatharam’, as Avatar is a stylised truncated western word!) belongs to Vishnu the protector God. Vishnu is of blue colour, has 1 head, but 4 arms, and in each arm he carries a magical weapon or an object. The weapon of choice for Vishnu is the spinning disc called `Charkram’. (This weapon was popularised by the Australian made TV show `Xena:Warrior Princess’ a decade ago). Vishnu is actually `born’ as a human (in the cases of Avatars 5,7,8, & 9) and lived as human, and endured various troubles and challenges. At the end of these Avatars, he undergoes physical death, and then returns to his divine form of Vishnu. 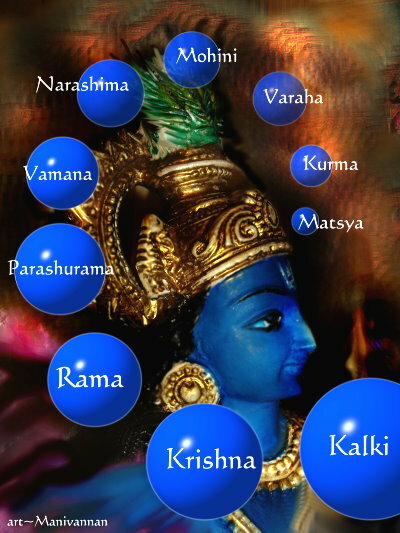 Here are the 10 most important Avatars of Vishnu. 1. Fish (Matsya)– the small fish who first appeared to a King and warned hi of the coming great flood. Later the fish returned as a giant fish and pulled a great ship (arc) to safety, so that humanity can survive and start again. (yes, the hindu myths have their own version – the original perhaps- of the biblical flood). 2. Turtle (Kurma) – Vishnu appeared as a giant turtle and became support under the ocean, so that a giant mountain can be placed on its back, and the mountain spun as a churner of the Milky Ocean for the extracting of the elixir. 3. Wild Boar (Varaha) – When a demon took the Earth and hid it under the great seas, Vishnu appeared as a Wild-Boar with great tusks, defeated the demon, and dived to the depsh to dig out the Earth. 4. Narasimar- half lion and half human, that came out of a Pillar in a palace of a demon to defeat the demon and save the devotee Prahalathan. 5.Vamanar – a dwarf priest who manifested later as a cosmic giant and measured the earth and havens under his feet. 6. Mohini – a nymph who appeared and distracted the demons, during the churning of the milky sea and eventual finding of elixir of life. (Had the demons consumed the elixir they would have become immortal and undefeatable). 6* Bhudda: In Some versions of myths, Mohini is not counted, but Bhudda is considered one of Vishnu’s avatar. 7. Parashuraman – A Priest (Brahmin) who was forced to avenge for the death of his father, and defeat certain oppressing demons clans! 8. Raman – First of the most well-known avatars of Vishnu (great hindu epic `Ramayanam’ tells this story). Raman was the eldest son of a king. As a result of manipulation by one of his step-mothers, Raman was exiled to the forest for 14 years, during which time, his wife Sita was abducted by a demon. Raman then formed a mighty army with monkeys and wild animals, built a bridge across the sea and waged war to defeat the demon and get his wife back. 9.Krishnan (Ktishnan) – one of the 2 most famous ones. He was a key character in the hindu epic `Mahabaratham’ (great story) and took up the role as a Charioteer for one of the heros in the great war. 10. Kalki – this is an avatar that is believed yet to come, at the end of the world. A warrior on a white horse bearing sword will come, to destroy the world at the end of Kali-Yuga (the most difficult and corrupt of the aeons of hindu cycles), so that the world may start anew. In a recent discussion, one friend noted that even the idea of Jesus Christ, Son of God, could be said to be an Avatar of the divine God, because, Christians believe that there is only one God, and yet they also believe that one God sent his Son to Earth. In any case, here we stand, at the end Kali Yuga, awaiting the final Avatar of Vishnu! When it comes, I am sure we’ll know who it is – for it will be to destroy the wicked, deliver justice, and restore purity in the world! Manivannan Navasothy. London, January 2012. Previous PostGoddess Ganga Devi who drowned her babies (Karmic thoughts on Miscarriages)Next PostRage, Power..and Freedom – Magic of the Wildman within?